After the recession in the West, there was some soul-searching and critical rethinking on the virtues of capitalism. Many of them called for a radical renovation of the capitalism by bringing in some of the principles of socialism like equity or more government intervention. This book under review belongs to this category of rethinking capitalism but with a difference. This book is not a critique of capitalism. On the contrary, the authors are confirmed capitalist and hail capitalism as one of the greatest innovations of human mind for bringing widespread prosperity to people. But they also argue, capitlaism can still evolve into something higher and better and more soulful. The unique feature of the book lies in its positive approach to the subject. While most of the other rethinkers focus on the defects of capitalism and suggest remedies, the authors of this book highlight the positive features of capitalism and looking further ahead, presents a practical blueprint for harnessing the still untapped potentialities of capitalism. The authors of this book under review, John Mackey and Raj Sisodia are confirmed capitalists. In a chapter titled “Capitalism: Marvellous, Misunderstood, Maligned” the authors state “In the long arc of history, no human creation has had a greater positive impact on more people, more rapidly than free-enterprise capitalism”. With supportive data, the authors argue eloquently “The success of the enterprise capitalism in improving the quality of our lives in countless ways is the most extraordinary but poorly understood story of the past two hundred years” like for example “Just 200 years ago, 85 percent of the world’s population lived in extreme poverty; that number is now only about 16 percent. Free-enterprise capitalism has created prosperity not just for a few but for billions of people”. Capitalism is not something evil as some of the spiritual ethical or socialistic idealistis think. There are two positive features in capitalism which has to be retained. First, free enterprise with competition promotes efficiency, productivity and innovation. Second, contrary to popular belief, that capitalism has helped only a few to become superrich, it has brought prosperity to a large number of people, especially in the West and helped in their economic upliftment from poverty to middle-class prosperity. Beyond these two plus points, other claims made by the authors, like for example, it is the greatest system of “social cooperation” or “inherently virtuous” are questionable. There is the other dark or shadowy side of traditional capitalism like centrality of self-interest, greedy commercialism, reckless consumerism, massive inequality, lack of a humane, ethical and ecological values or a higher purpose. The authors attribute this flip side of capitalism to later development and argue that it is not inherent to capitalism. According to the authors, Adam Smith, the founding father of capitalism recognised both self-interest and the ethical motive. Though, in his original and well-known book “Wealth of Nations”, which gave birth to the capitalistic philosophy, the father of capitalism hails self-interest as the source of wealth, in his earlier work on the “Theory of Moral Sentiment” he talks about ethics and empathy. According to the authors the degeneration in capitalism is due to the fact that economic thinkers who followed Adam Smith failed to integrate his ethical views into economic thought, and as a result, Smith’s views on ethics are largely ignored and capitalism developed in a stunted manner, missing the human half of its identity” However Adam Smith himself made no attempts to integrate his ethical and economic ideas into a synthesis. They remain in two distinct domains. Just because Adam Smith was the founder of Capitalism and wrote a book on ethics, we can’t claim capitalism has an ethical origin. Smith’s ethical ideas remains as his personal views and they can’t be regarded as part of capitalist philosophy. His original classis “Wealth of Nations” is the true foundation of capitalism, which has no ethical or humanistic content. So there is nothing “intrinsically virtuous” in traditional capitalism. This moral vacuum in the origins of capitalism is the source of all the negative features of this economic system. Capitalism is an efficient and effective mechanism for generating economic prosperity but as a philosophy it lacks a conscious higher purpose and values. The free market of capitalism is morally neutral or sometimes seems to favour the unethical and the exploitative. Mackey and Sisodia talks about the wonderful innovations promoted by capitalism. But capitalism has also nourished exploitative “robber barons” and massive armament industry with no ethics or scruples. So the first step in rethinking capitalism and steering it toward a higher level is to discover this higher purpose with a new ethical, human and ecological orientation. In this book under review Mackey and Sisodia do this creative work of discovering a higher purpose for business with an admirable clarity and vision. This holistic philosophy of business is made of four principle or basic tenets. First is a Conscious Purpose which means conscious pursuit beyond profit and shareholder values which defines the meaning of a firm’s existence. Second is Stakeholders Integration which means creating value not only for shareholder but for the entire stake holder community made of suppliers, employees, customers, society and the environment and building a mutually enriching win-win relationship with all of them. Third is Conscious Leadership which is conscious of the higher purpose of the organisation. Fourth is Conscious Management where the above three tenets have become an integral part of the organisation culture and governed by the values of empowerment, egalitarianism, loyalty, love, caring, decentralisation. Mackey and Sisodia devote a full chapter to each and elaborate on it extensively with examples. The integral approach to management agrees in principle with the vision and basic tenets of conscious capitalism. At a macro level, even for a predominantly economic system like capitalism, prosperity or financial profit can’t be the whole aim. It must aim not merely at material prosperity but at material, economic and social well being, which includes education, health, nutrition, equity, empowerment of women, good infrastructure like transportation and communication. This is now well-recognised in modern development studies but not part of traditional capitalism. And a business organisation which contributes to the economy is something much more than an economic system; it is a human organism made of people. The success, wellbeing and progress of the organisation depend on the creativity, progress and wellbeing of its people. For the sustained higher growth and evolution of the organisation, this progress should be not only interms of career, skill and knowledge or material and economic wellbeing but also in the moral, aesthetic, psychological and spiritual domains, which means a progress guided by the values of truth, beauty and goodness. People have to be given sufficient inner and outer space and leisure to grow in the consciousness of these higher values and express their growth in their work-life. Sri Aurobindo describes the integral view of economics. The other point of agreement is consciousness. In this integral perspective, consciousness is the source of the individual and collectivity and the constant growth in consciousness holds the key to higher evolution, progress and fulfilment of the human organism. We have to become increasingly conscious of our own self, the world around us, our connetedness with all life, higher laws of life, meaning of our life and work, and finally the spiritual source of all these, God or the Divine or the eternal Consciousness which is the origin of our own being and the Universe, where we become one with all life. 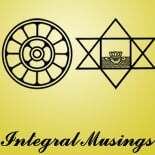 In the integral view, this growth in consciousness can be achieved in and through work and life or in other words, work and life can be a potent means for progress in our consciousness. The integral view conceives a four-fold integration. First is the integration of the individual; second is the integration of the organisation; third is the integration of the organisation with the community; fourth is the integration of the organisation with universal nature. Integration of the individual creates fully conscious leaders. Every individual is a four-fold organism made of his or her physical, vital, mental and spiritual being. Physical is material body which is not merely inanimate matter but has its own consciousness. Vital is the source of our sensations, emotions, desires, vitality, energy and the dynamic faculties of action and execution. Mental is the source of our faculties of knowledge and all our ideals and values. Spiritual is the inner source and centre of our being, our true self beyond our body, life and mind. Every individual, especially the leaders, has to become more and more conscious of his four-fold being and their faculties and potentialities, and integrate them harmonious around her true self, the spiritual source of his being. Integration of the collectivity creates the conscious organisation. Like the individual every collectivity has a physical dimension made of its material structures, like the buildings, the machinery and geography; a vital dimension made of its economic, social and political life, its dynamic structures of power, relationship, organisation and execution; a mental dimension made of its knowledge, values, ideals and cultures, a spiritual dimension, which in most organisations remains as an unmanifest potential, but when it manifests it awakens the organisations to the unity-consciousness of the spirit, which can give the intuition and experience of an all-pervading sense of unity, interdependence and connectedness with life, humanity or Nature. Integration of the organisation with the community includes the “stakeholder integration” which is one of the principles of the philosophy of consciousness capitalism. This integration has to come out of a collective consciousness of the oragnisation becoming more and more conscious of itself as part of a larger whole of life, made of the stakeholder community and the social environment, and as a result, feels that the interests, well being and progress of this larger whole as part of its own interest, well being and progress. And finally, integration of the organisation with universal nature has to be achieved not only at the physical level but also at the psychological and spiritual level. In this integral view we are a part of Nature not only physically but also psychologically and spiritually or in other words our physical, vital, mental and spiritual energies are derived from the corresponding dimensions of universal Nature. Just like our physical sustainability depends on attuning our material life to the laws or ecology of the physical Nature, our psychological and spiritual sustanability depends on attuning our inner being to the higher laws and ecology of the psychological and a spiritual dimensions of Nature. This entry was posted on February 11, 2015 by integralmusings in Case studies and reviews.